Which network is streaking ahead in our 4G test? With Vodafone and O2 launching their 4G networks to take on the increasingly speedy LTE offering from EE, we picked up a handset from each carrier (along with an 'Ultrafast' HSPA+ phone from Three) and trawled around London to see what kind of speeds consumers can really expect if they fork out the extra money for the next-generation mobile speeds. It's very hard to give definitive speed results in any given location, but as London is one of the only places in the UK with 4G from O2, EE and Vodafone at the moment (plus one of the highest densities of masts broadcasting the signal) we considered it adequate for getting a feel for what was on offer when it came to next generation speeds. We decided to go with a variety of phones all capable of connecting to the 4G signal – in the case of 3 this wasn't necessary, so we stuck with the tried and tested Samsung Galaxy S4. For Vodafone, we chose the HTC One Mini; for O2 the Samsung Galaxy S4 was offered and with EE we went for the larger HTC One. We used the Speedtest.net app to determine ping rates and download speeds in each location, ensuring there was a 4G connection (or HSPA+ in the case of Three) wherever possible – although no matter how hard we tried, there were occasions where an LTE signal just wasn't happening. Ping test: to determine latency (the delay) between your phone / tablet and the server. The lower the rate, the faster the connection, and the less time waiting for your data to start arriving. And in the interests of fairness, we ran the test at least three times on each phone, giving an average score at the end to ensure we didn't get caught out with an anomalous result during the testing. We gave each network a score out of four for each test to help us determine TechRadar's utterly unofficial Best 4G network. So how did each network get on? Does Three's claim that its Ultrafast network can be a good stopgap before it brings 4G later in the year hold water? Does EE's double-speed 4G network actually allow users to get much faster speeds? And can one man walk around London holding nearly £2000-worth of telephony and not get mugged several times? To kick off our test, we decided to start at home – right in TechRadar's offices. Checking the coverage maps showed that we were supposed to get good indoor coverage with O2, Three and EE, while Vodafone was outdoors only. Colour us as surprised as a leopard that realises it looks better in pinstripes to find that not only did O2 and EE not manage to get anywhere near the expected speeds (O2 not even finding a 4G signal) but Vodafone defied its own maps to provide blistering speeds time and time again. Next up, a stop at the Shard later in the evening provided a great chance to test connection speeds. With loads of people milling around and a number of offices and homes within reach, this would surely test the signal in a new way, with all networks promising good coverage – and achieving it too for the most part. EE fans will be pleased to note that once the indoor shackles were off, it leapt to the top of the leaderboard. Vodafone did not fare as well with a 4G signal hard to come by, while O2 and Three sailed through the test. 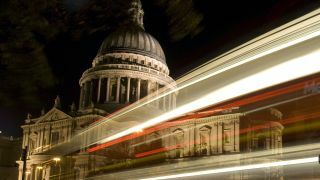 Now here's an odd one: while neither O2 nor Vodafone confirmed the outlying parts of London as towns or cities imbued with 4G, several of them were actually able to connect to the service, according to the coverage trackers.